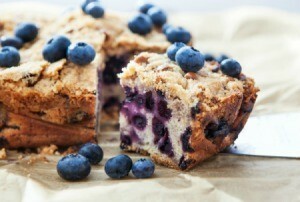 This guide contains a crumb-topped blueberry cake recipe. This delicious and simple blueberry cake is topped with a nutty crumb topping. You can use either fresh or frozen blueberries, making this a recipe you can enjoy year round. In a small bowl, combine all crumb topping ingredients. Stir until mixture is evenly blended and crumbly. Set aside. In a large mixing bowl, combine flour, sugar, baking powder, baking soda, and salt. Stir well. In a large measuring cup, combine milk, eggs, butter and lemon juice. Stir liquid ingredients into flour mixture until blended. Pour into buttered 13 x 9-inch baking dish/pan. Sprinkle blueberries evenly over batter. Sprinkle with crumb topping. Bake at 350 degrees F. for 40-45 minutes. Can be served warm or cold.